Goodreads says, "Grieving the death of her godfather and haunted by her cousin Cassie’s betrayal, Barrie returns from a trip to San Francisco to find the Watson plantation under siege. Ghost-hunters hope to glimpse the ancient spirit who sets the river on fire each night, and reporters chase rumors of a stolen shipment of Civil War gold that may be hidden at Colesworth Place. The chaos turns dangerous as Cassie hires a team of archeologists to excavate beneath the mansion ruins. Because more is buried there than treasure. A stranger filled with magic arrives at Watson’s Landing claiming that the key to the Watson and Beaufort gifts—and the Colesworth curse—also lies beneath the mansion. With a mix of threats and promises, the man convinces Barrie and Cassie to cast a spell there at midnight. But what he conjures may have deadly consequences. While Barrie struggles to make sense of the escalating peril and her growing and forbidden feelings for Eight Beaufort, it’s impossible to know whom to trust and what to fight for—Eight or herself. Millions of dollars and the fate of the founding families is at stake. 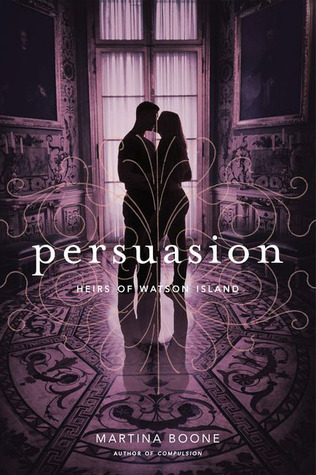 Now Barrie must choose between what she feels deep in her heart and what will keep Watson’s Landing safe in this stunning addition to a series filled with “decadent settings, mysterious magic, and family histories rife with debauchery." In Compulsion, Barrie gets the horrible news that her godfather has died and she has to return to San Francisco to pick up his remains. Upon her arrival back to the Watson plantation, she discovers that there are ghost hunters, treasure hunters and more curious people surrounding the plantation to the point where they had to close the tea room. To make matters worse, Barrie and Eight aren't exactly getting along. He has hid information from her regarding the current state at Watson plantation and he also has an important decision to make regarding college. Should he go away or stay local for Barrie? During this entire mess, Barrie meets a strange man wandering the plantation named Obadiah. She thinks he is just another crazy person hoping to find treasure, but he explains to Barrie that he has a personal connection to the Colesworth curse; plus, he seems to possess magic. Can he be trusted? 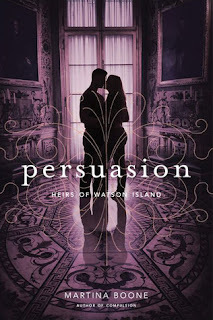 Martina Boone's second book in the series, Persuasion, is an entertaining and atmospheric fantasy, but it leaves readers with even more questions than before. I am starting to like Barrie more and more in Persuasion as she gets stronger and more assertive. I loved the relationship between Barrie and Eight in Compulsion, but here it felt a bit smothering. I felt like Eight was always showing up to get her out of her jams and I sort of wanted Barrie to be her own hero for the most part. Of course her not-to-be-trusted cousin, Cassie, is back in the picture in Persuasion, but she isn't the Cassie we remember from Compulsion. She is dealing with some major post-traumatic stress from he events of Compulsion and her family might lose her plantation. So, things aren't all rainbows and sunshine for Cassie. The best part of Persuasion for me is the Southern Gothic vibe. I love it so much along with the atmosphere that Boone creates in this series. Combine that with magic and romance, it makes for a fun read. However, I must admit that I liked Compulsion a bit more. Hopefully that is just because this is the 2nd book in the trilogy; I find that happens quite frequently. Nonetheless, I am excited to read the third book, Illusion, and find how it all ends as Persuasion left me with many questions. Isn't it interesting how the second book in a trilogy seems to be the one we all enjoy the least, yet it manages to keep us hooked? I kind of love that - ha! This sounds like a perfectly creepy and dark fall read, Christina! Yes, that consistently happens to me! It just happened again, actually! It is the perfect book for fall though...you are right! Thanks for visiting, Tara! I'm glad you felt the same way, Leanna. Yeah, I have been struggling with the second book in a series for sometime now. I agree about Barrie...frustrating at times. I will definitely pick up book three though. Thanks for visiting!